This contemporary log cabin, with a largely glazed frontage, will add a stylish touch to any garden environment, and yet it’s very practical too. Because this is one of the larger log cabins that we’ve reviewed there’s a lot that can be done with it. For example, we can easily imagine it being transformed into a craft workshop or acting as the base for a home operated business. Whatever it’s used for, the wide opening double door make it easy to move bulky objects in and out. Of course if you have expensive electrical items or furniture inside you’ll want to be assured that they’re safe, which is why we were glad to see that a key operated lock is included as standard. With the use of tough double glazing throughout as well this gives real peace of mind and in built protection. The log cladding itself on the cabin is made of thick Norwegian spruce, so it feels very stable and rigid when the assembly has been completed. Because the logs lock tightly together the cladding is also very good at keeping rainwater out, a function that’s also provided by the pitch of the tongue and groove pitch roof. We’ve reviewed lots of log cabins, but this has a look of its very own. In part that’s because of the front which is filled with glass surrounded by pale softwood cladding. It is important, of course, to add colour to the wood by way of a preservative treatment to stop it quickly fading to a silvery grey colour, but the combination should still prove very attractive. 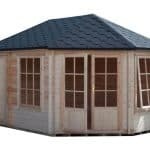 The other differentiating feature is the use of a tongue and groove pent roof, rather than an apex roof. This is still very effective at carrying rainwater away thanks to its pitch, yet it doesn’t stand out as obtrusively as an apex roof can. It still adds plenty of height as well, giving a peak height of 2.39m and an eaves height of 2.11m. This should be more than enough for even tall items, and creates a lot of interior space when combined with the overall width of 4.50m and the overall depth of 3.50m, both measurements not including the overhang of the roof. The cladding used on this log cabin is, for us, its stand out feature. That’s because whilst we often find cabins that have thick cladding, the 44mm cladding used here is among the very thickest that we’ve seen. Made from slow grown, and therefore strong, Norwegian Spruce it creates as very tough and rigid structure, so it’s ideal if you plan to position it in an area that could be exposed to strong winds. The floor is also reliably strong, which is important if you want to place heavy furniture upon it. It’s made of the same material as the roof, which is 19mm tongue and groove cladding. We were also pleased to see that it has integrated floor joists which lifts the floor itself above ground level and therefore protects it from the high moisture content found there. 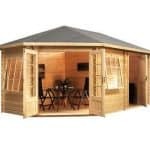 With a log cabin that carries a substantial price tag such as this we would have expected it to come with a long lasting preservative treatment, and therefore a long warranty against rot as well. Unfortunately both of these things are lacking, although it does come with a five year structural guarantee. This means that the customer themselves has to treat the timbers immediately with a high quality wood preserver, and then again on a yearly basis afterwards. Special attention must also be paid to preserving the pent roof, as although it’s made of thick tongue and groove timbers it doesn’t have a protective felt covering and is therefore exposed to the elements. We found the fully glazed double doors visually striking, and we were just as pleased to see that they have a very accommodating width when opened, even though we have seen taller doors on the log cabins we’ve reviewed. Whilst their height is 1.75m, the width of 1.45m makes it simplicity itself to manoeuvre objects such as a bed or sofa inside. The doors are flanked by two large windows, which means that the interior becomes flooded with light. We were pleased to see that the doors and windows are laminated with a rubber seal, so draughts are kept firmly out. This is also helped by the use of double glazing for windows and doors, which provides excellent insulating qualities as well as reducing the impact of external noise. Double glazing is much harder to shatter than standard glass, so this in itself can be enough to deter some opportune thieves who will quickly pass by if their initial break in attempts are thwarted. The security feature that we liked most of all, however, is the inclusion of a key operated lock. 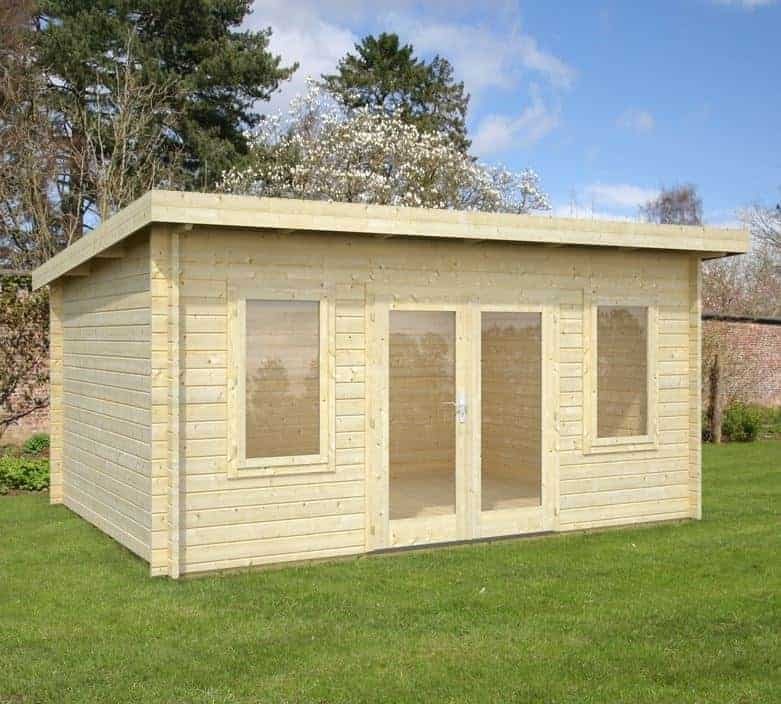 With the likelihood of valuable items being stored inside a garden building of this size, we feel that this gives added reassurance and peace of mind. 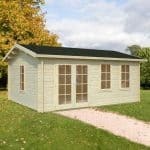 You may imagine that such a well proportioned log cabin featuring lots of glass will be difficult to assemble, but in fact the clear instructions make it much easier than we often find on similarly sized buildings. Even so, we understand that many people would rather have the cabin assembled for them so it was good to see that a professional assembly service is available to be purchased as an optional extra, even though it does come at a cost of £654. We found high quality components used throughout this building, as exemplified by the laminated door frame and tough chalet cut timbers. Such thick logs should be extremely durable given the right preservative treatment, but we feel it’s a pity that the emphasis for doing this has been placed on the customer. 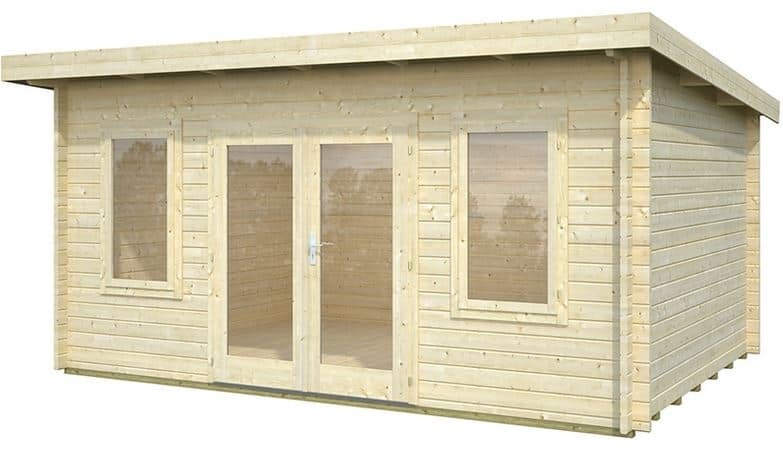 Whilst we have reviewed even larger log cabins, this has more than enough space to be used for either business, garden, or leisure purposes. The combination of a large structure made from thick logs doesn’t make it a problematic installation thanks to the straightforward instructions. You’ll need a friend to help, and you’ll need to allow a full day. 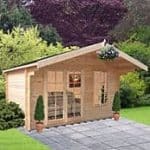 There’s no denying that this is a very attractive and versatile log cabin, but at nearly three thousand pounds it costs significantly more than many others we review. Final Thoughts: The design of this log cabin seems strikingly modern, and yet we feel that it will fit into just about any garden. It’s one of the most attractive garden buildings that we’ve reviewed, and the profusion of glass across the front creates a very well lit interior. 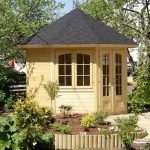 That’s one of the factors that make this log cabin so versatile: it could easily be used as a home office overlooking the garden, or with the addition of machinery it could be turned into a workshop. Alternatively of course it could be used as an extra room for your home and converted into a games lounge or maybe even a home gym. Whatever use it’s given, it will be essential to give it annual preservative treatments to retain its good looks and protect against rot.